I loved this the moment I saw it! For the full-sized version, click here. For more artwork, check out the OT graphics archive. That is so cute. Adorable. That is absolutly adorable! One tiny thing though, doesn’t Jim have green eyes? Still, gonna print it out and put it in my locker. I know, I’m a dork. So cute! That is the cutest picture of JAM ever! I wish i could draw like that! That’s so cute. Love it! Hmmm…I never noticed what colors their eyes are! I just looked at some photos of them and still couldn’t tell. i am so jealous of your amazing drawing skills. i could NEVER do that. if i did, it would look like jim’s self-portrait for dwight: a stick figure. ha ha. thanks for sharing! Ah! I am an anime fan at heart so this picture just is…wonderful. 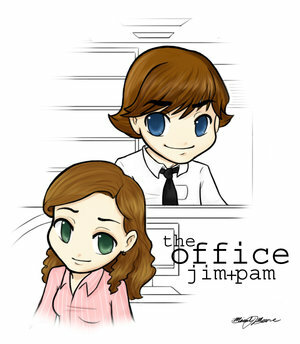 I was actually hoping that someone would draw The Office characters anime style so this is perfect! Such a great job!!! I love the attention to detail with Jim’s top button being unbuttoned and his tie loosely tied ala Season Two. That’s how I wear mine…with the sleeves rolled up. i love this picture! thank you so much for sharing it! you are very talented. Hey! !Awwwww So Cute! !My Name Is Pam Too!